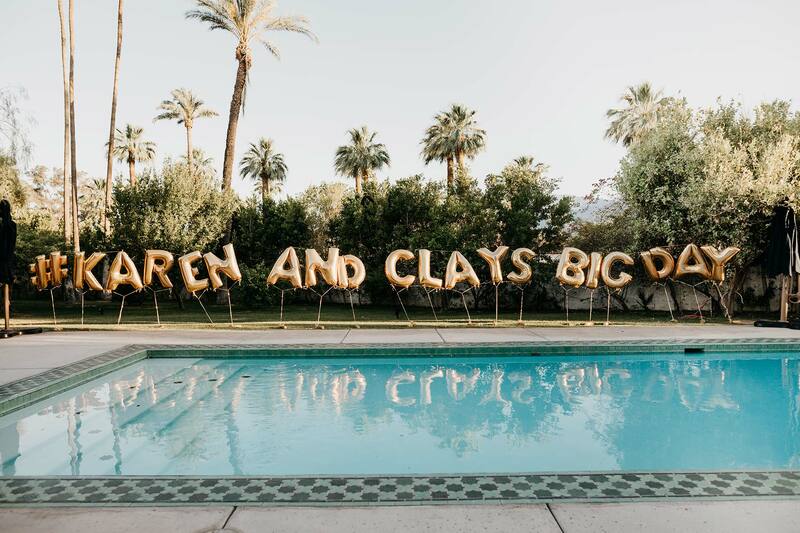 Karen and Clay’s Big Day! Clay and I got married almost two months ago. As everyone warned, the weekend indeed flew by in the blink of an eye. We spent our very long flight to our honeymoon the next day trying to remember every detail together. 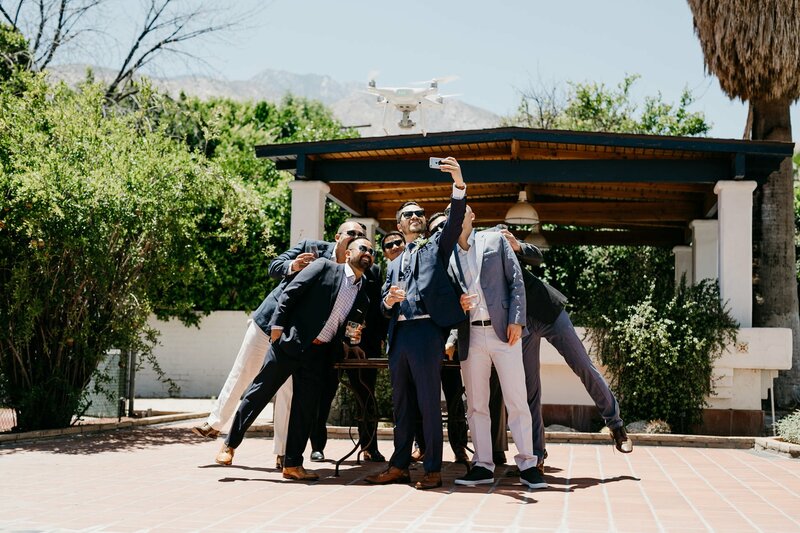 So when we got our photos and videos back, we had so much fun re-living the wedding and seeing every detail we missed. There were times during the wedding planning process when I just wanted to elope. 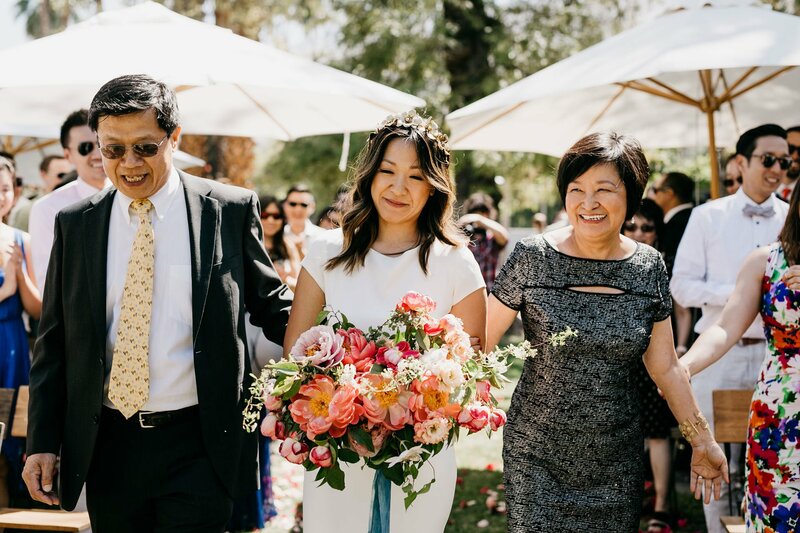 To start with, I’m not one for wedding traditions– there were so many things that people insisted I had to have but I didn’t understand why. 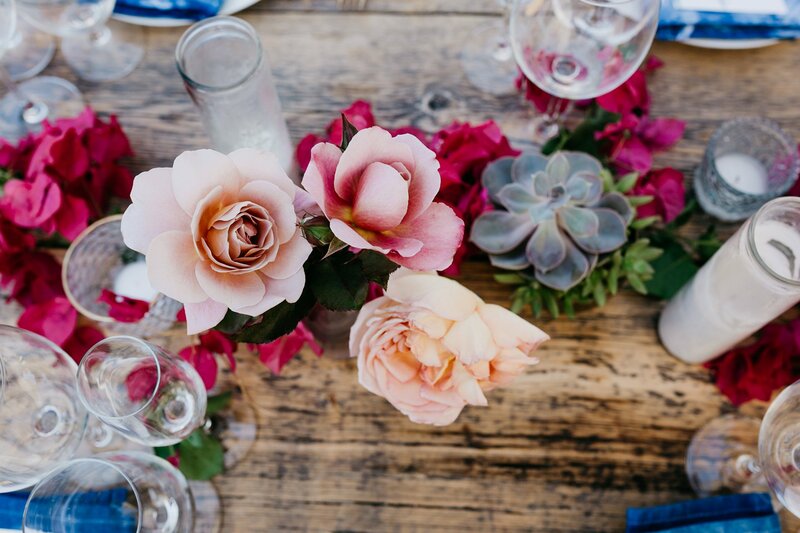 Add the stresses of planning a huge party and I was so over the wedding before it even began. 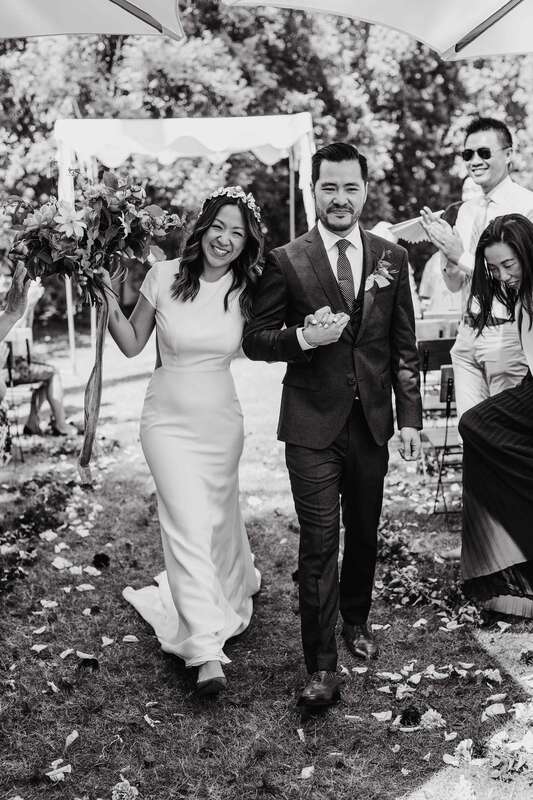 But, the weekend of our wedding ended up being truly incredible. Someone once said to me, this is the only time all of your family and friends you care most about will be together in celebration. 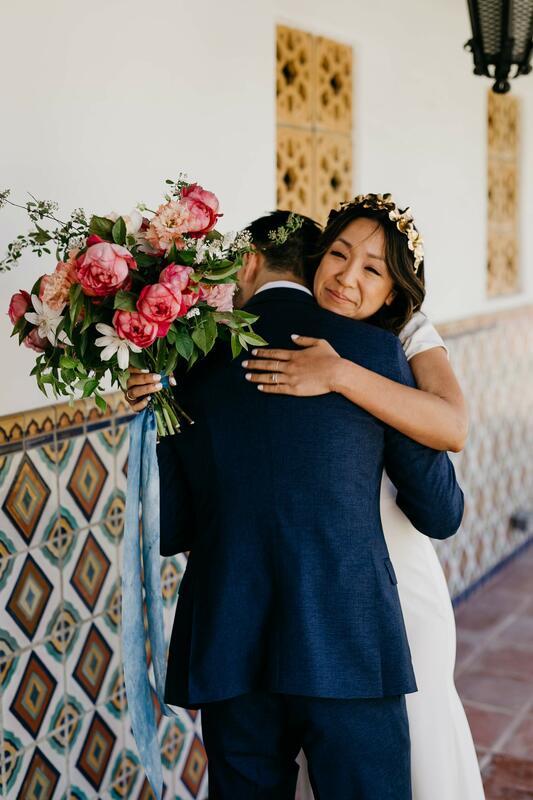 And that alone was worth everything– the weekend was filled with so much love, tons of laughter and a few tears (okay, maybe a lot of tears). 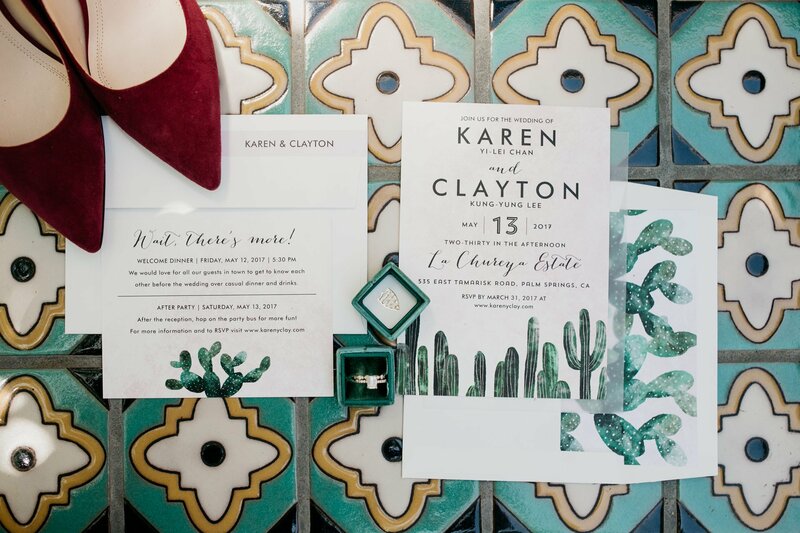 When we first embarked on the wedding planning process, we knew we wanted to make our day unique and reflect our personalities in a special way. We did away with certain wedding traditions (like wedding parties and a wedding cake– see below for more on our “wedding cake”). 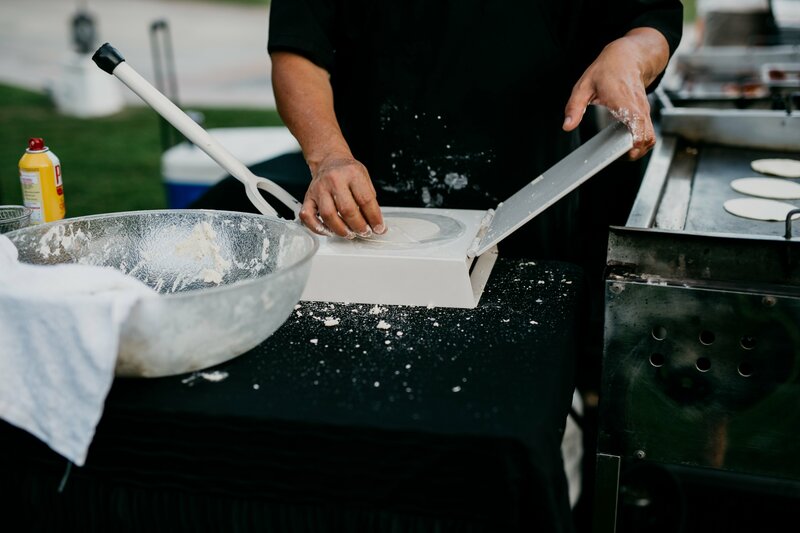 More importantly, we wanted to ensure our guests ate and drank beyond their expectations and walked away with a memorable “Clay and Karen” experience. 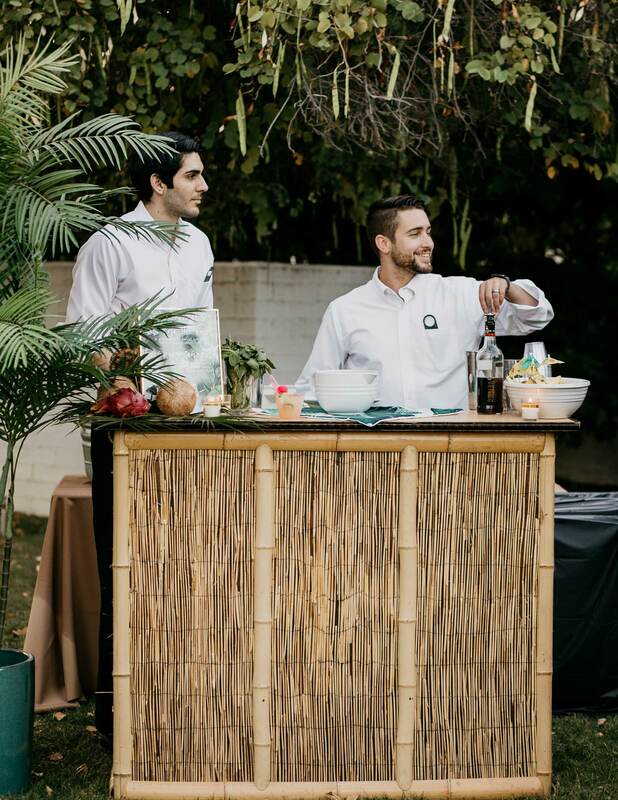 Of course, food and drinks were a high priority item for us and Miho Catering Co. made every foodie dream come true, everything from a raw bar to a wood-smoked cocktail. After all, everyone came from all over the country to be with us for the weekend on our special day, we wanted to them to have fun! 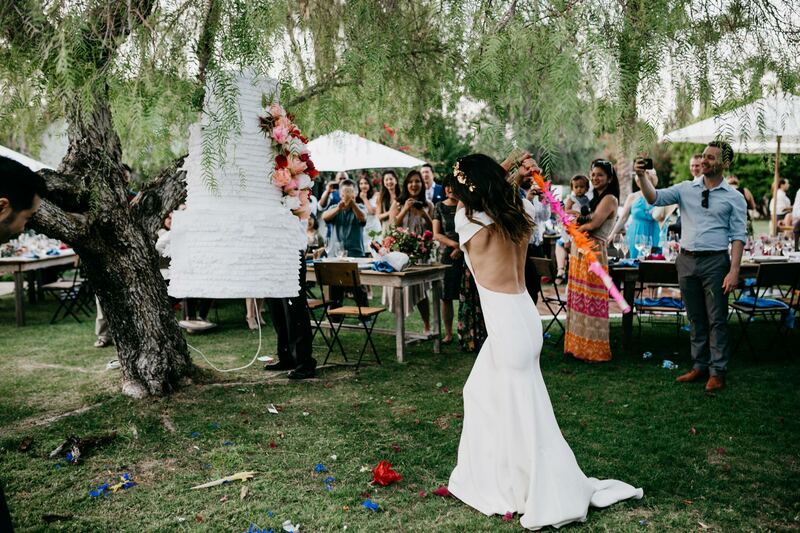 We chose a venue, a private estate called La Chureya, in Palm Springs and Celebrations of Joy, our wedding planner, made it everything go off without a hitch. 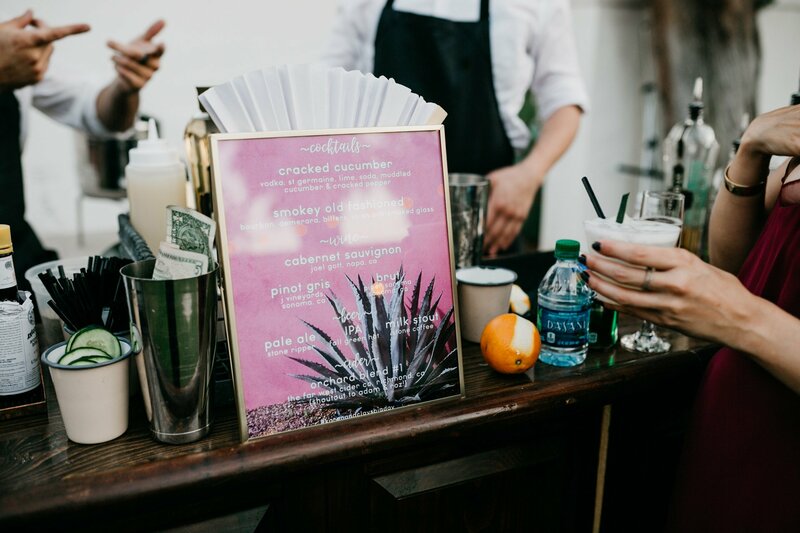 On Friday night, we welcomed everyone with a Tiki & Tacos welcome party (scroll down to the end of the post for snaps from our welcome party) complete with some of LA’s best tacos, East Side Tacos, mai tais and frozen paletas! 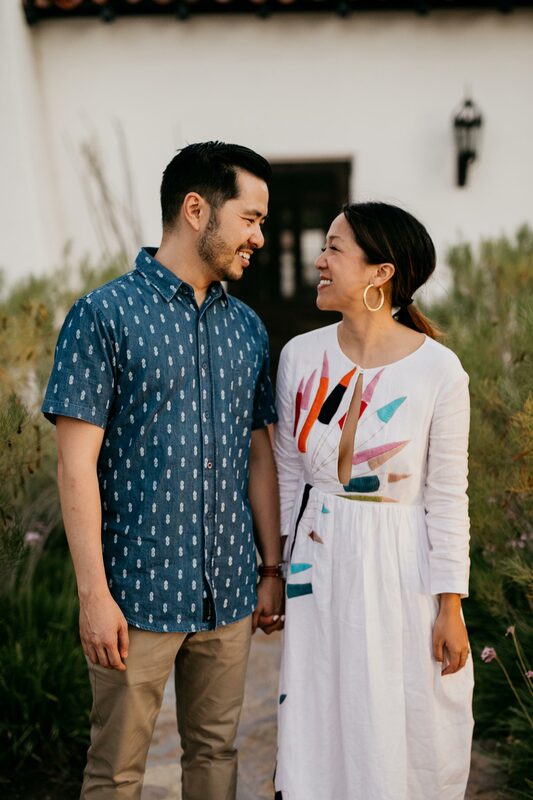 So without further ado, I’m so excited to share with you a full rundown of our wedding weekend. 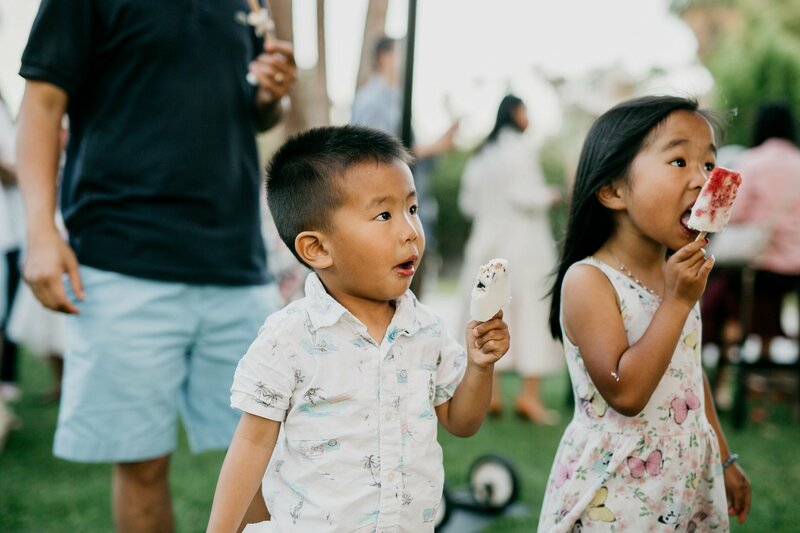 The gorgeous photos in this post are by Luke and Mallory and our super fun video by The Quail & The Dove (Check out the piñata video below). 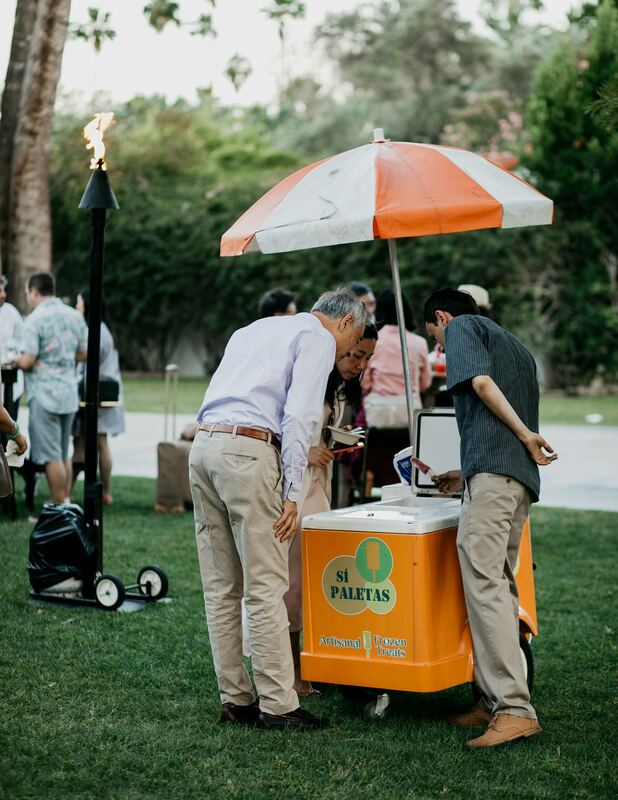 At the bottom of the post, you’ll find all our vendors, who we loved working with– they really made our day come together! 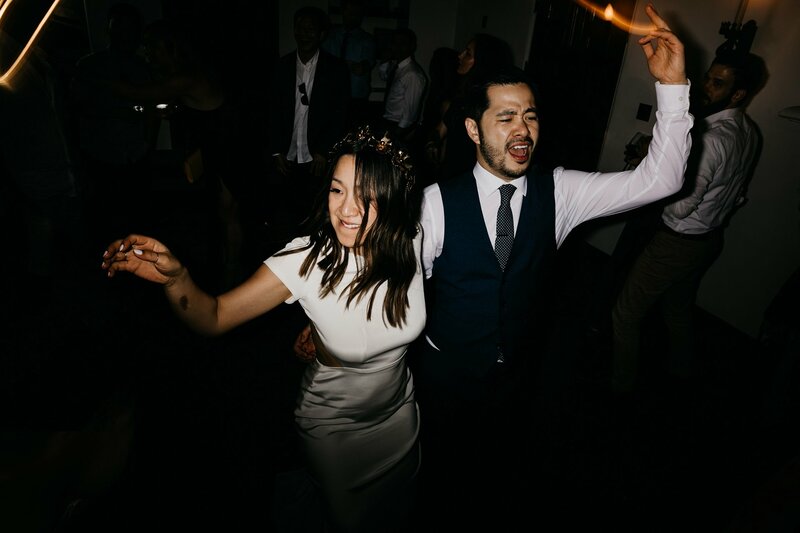 We knew from the start we wanted our wedding to feel like an intimate house party. La Chureya is a stunning property and is a specimen of beautiful Spanish architecture in a desert oasis setting. Once we visited the property, we fell in love right away. 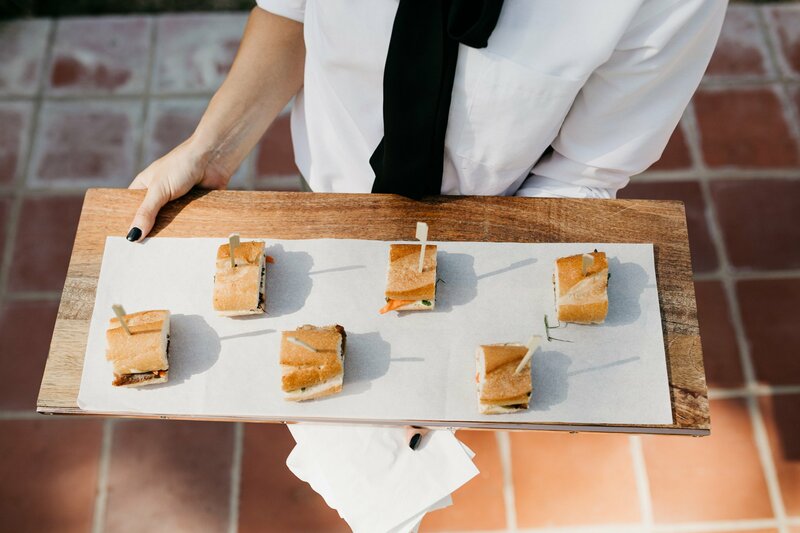 Having the wedding at a private estate enabled us to customize the look and feel of the wedding to our liking and more importantly, to bring in our own caterer, which was of the utmost importance to us, obviously! 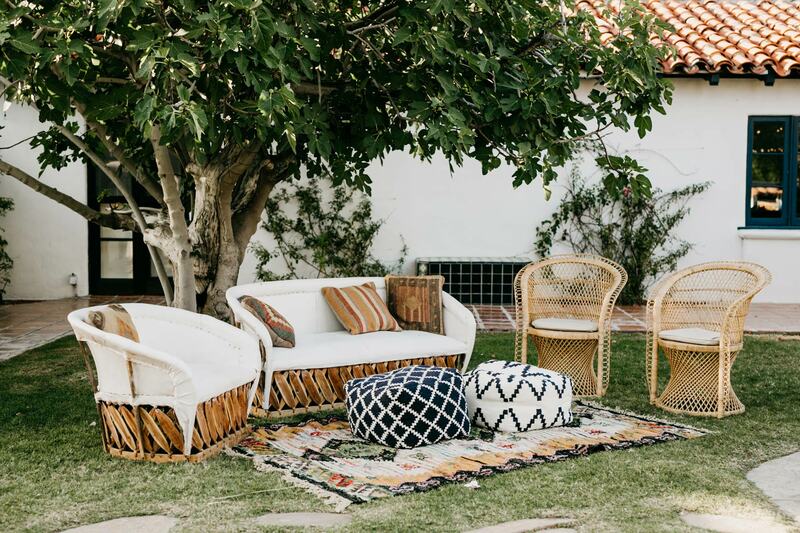 For example, we were able to use the venue the night before for our welcome Tiki & Tacos party (more details below), use the various indoor and outdoors spaces and the furniture however we liked, and of course stay at the venue during the days leading up to the wedding and the day after. 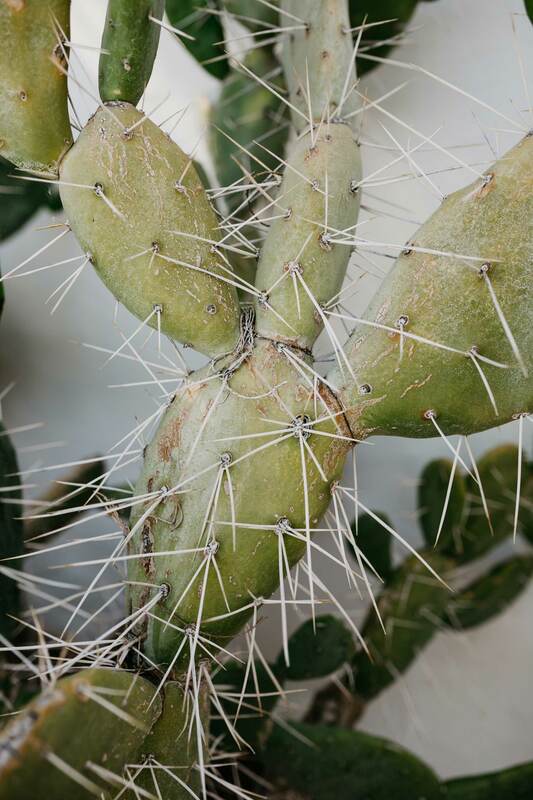 While we were able to have a bit more creative freedom, this freedom did come with a bit more legwork in terms of sourcing vendors and working out logistics respectively. 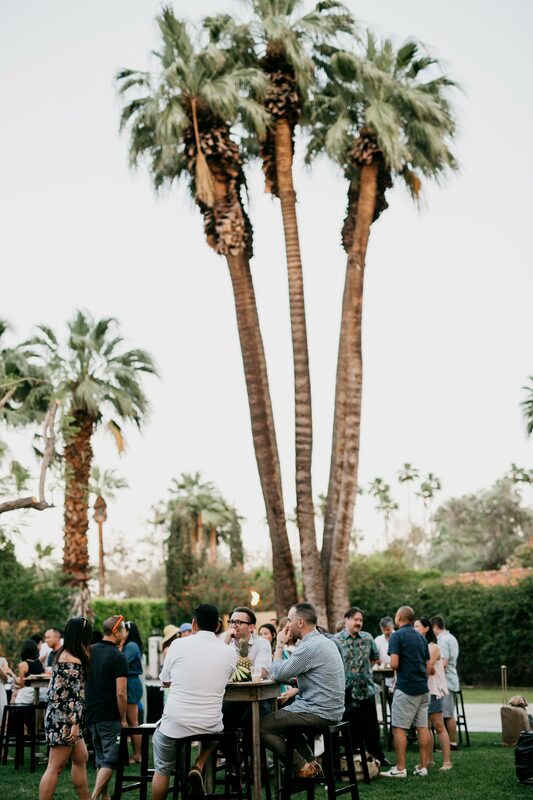 A tip for those who are planning to have a wedding in the city of Palm Springs: you should be aware that the city is policing the strict noise ordinances a bit more these days. 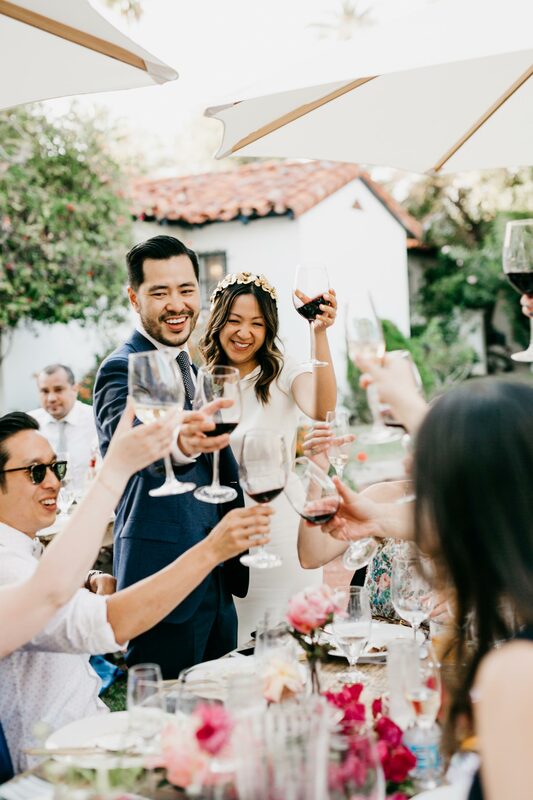 As a result, some weddings receptions have to be moved indoors or shut down early depending on the location of the venue. Luckily we were able to move our dance floor inside as a last minute compromise! Ok, let’s get to the good stuff. 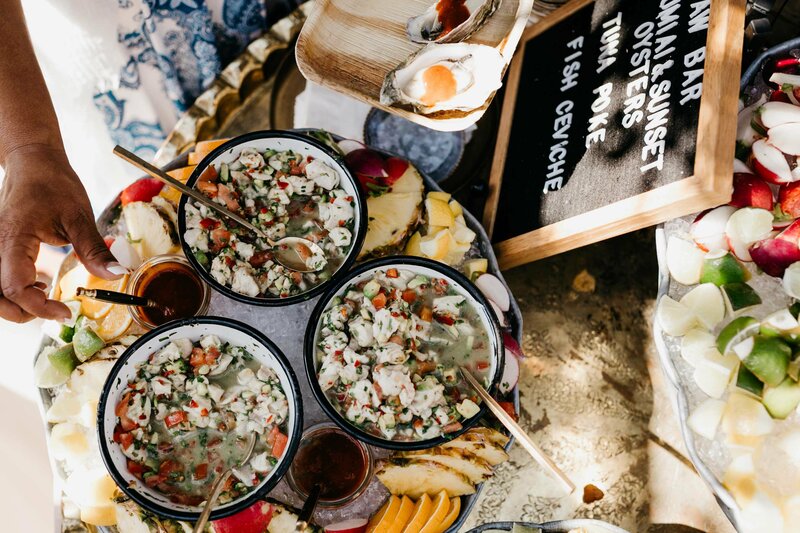 This wouldn’t be a proper Honestly Yum bash without food and drinks that would blow our friends and family away. 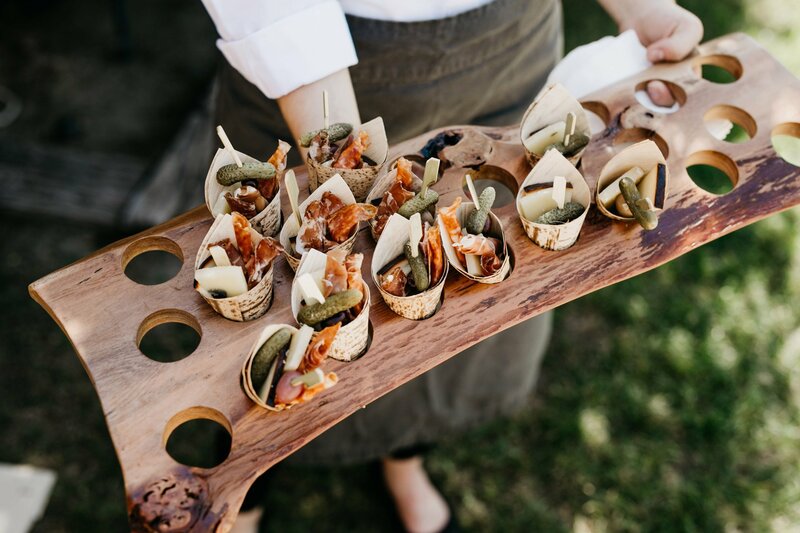 After a ton of research, we knew that Miho Catering Co. offered the perfect combination of beautiful presentation and interesting flavors influenced by Asian and Mexican cuisines – two of my favorites! We also liked how they sourced as many local ingredients as possible and made everything from scratch. They were also flexible with the menu and accommodated custom requests, including some food and flavors that Clay and I knew we had to have. 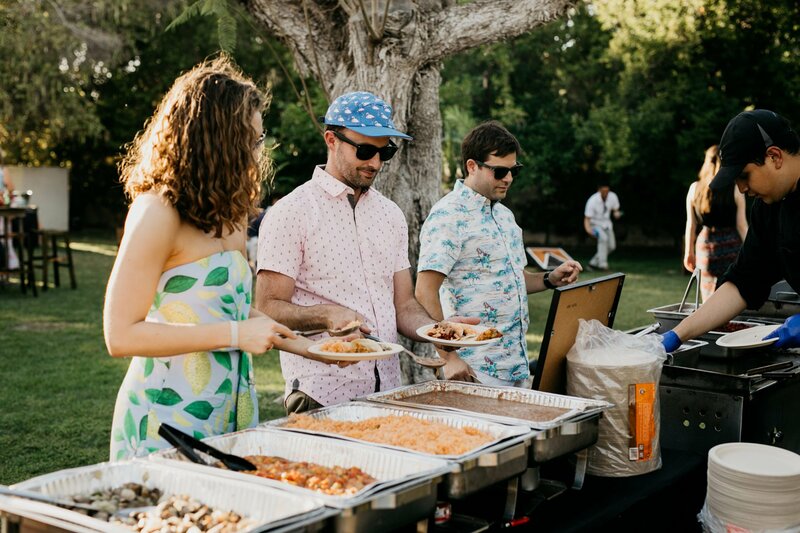 I must say, we initially had low expectations for catered food, because you know, it’s catered food, but the food and drinks exceeded our expectations. 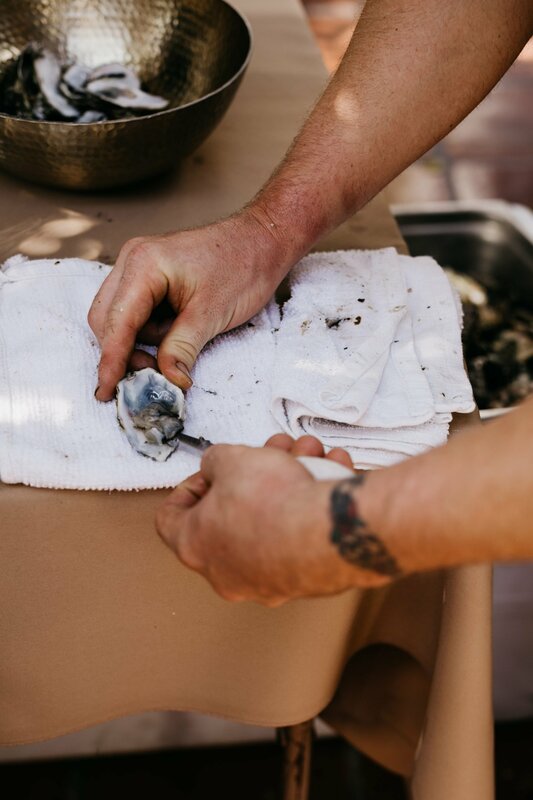 One of our first dates was at Hog Island, where we shucked oysters in Tomales Bay and we knew we wanted freshly shucked oyster at our wedding. 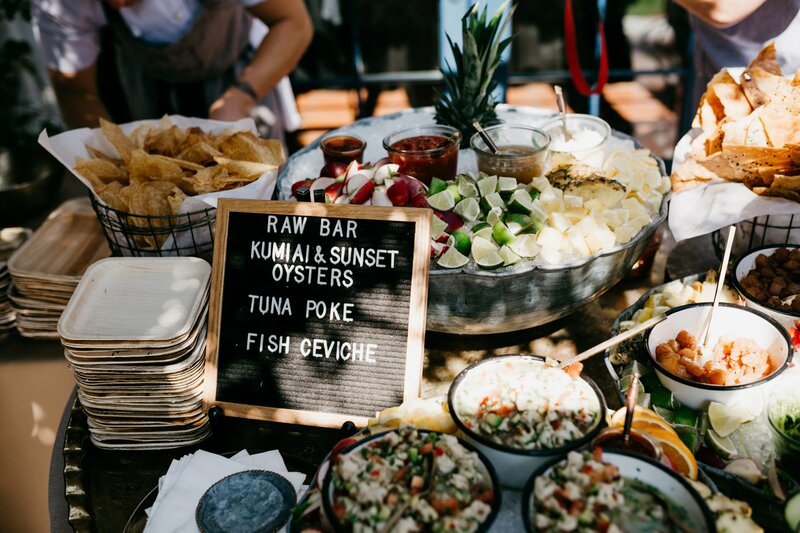 Of course, Miho not only made it happen, but added a whole raw bar, complete with local tuna poke and local white fish ceviche. And all of the raw bar offerings were served with lemons, limes, jalapeño lime mignonette, house made cocktail & hot sauces, hand made crackers & taro chips. For our passed appetizers, we had charcuterie and cheese cones, which went perfectly with the raw bar treats and because I love Vietnamese food, Miho worked with us to add pork belly banh mi to the cocktail hour menu, served as western sliders in a yummy bite-sized format. 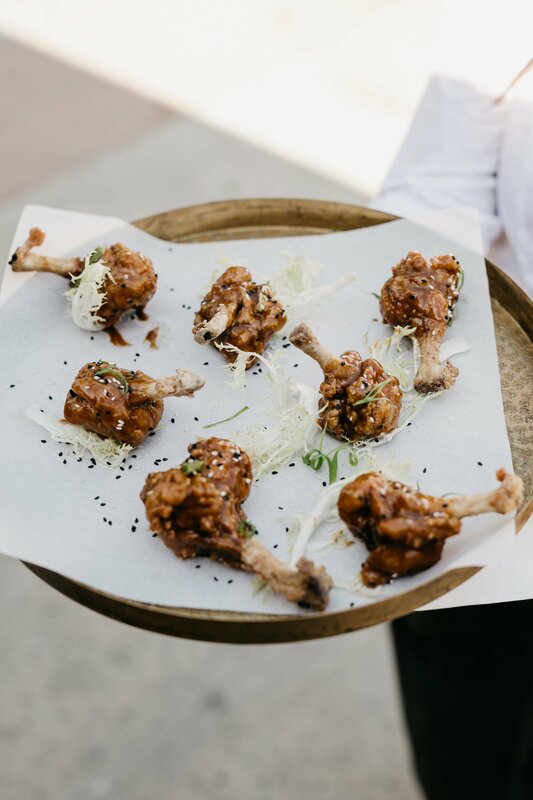 Since Clay’s a big chicken wing fanatic, it was vital that we had Miho’s crispy Thai chile drumettes tossed in roast garlic, sesame, and a peanut sauce. And to round out the apps, the mushroom arancini bites (fried and stuffed risotto balls) with a saffron-yogurt sauce were a hit with vegetarians and carnivores alike. 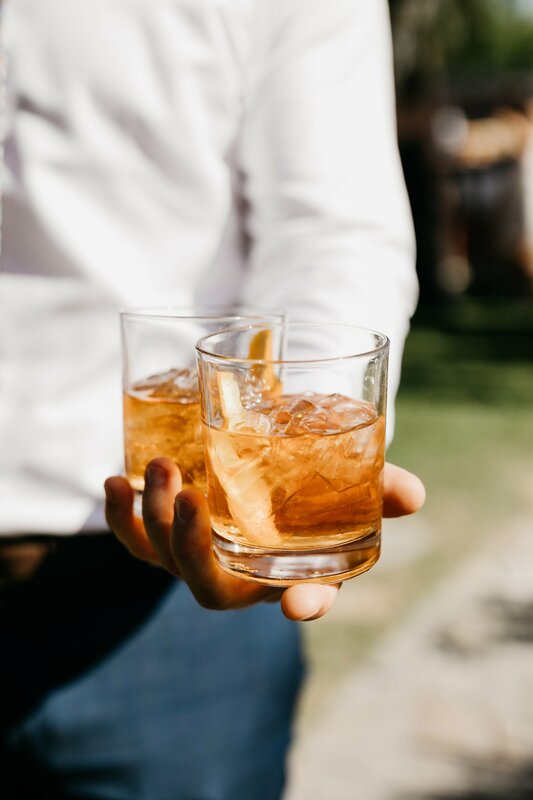 To wash down the eclectic assortment of finger foods, and the dinner that followed, Barcon wowed the guests with a Smokey Old Fashion cocktail: each old fashion was infused with actual smoke from harvest wood– the wood lit right behind the bar. For those thirsting for something lighter, the Cracked Cucumber was a refreshing blend of vodka, St. Germaine, lime, soda, and muddled cucumber and pepper. Our friends own a cider company in the Bay Area, Far West Cider Company, and provided a fresh keg pouring their house favorite, The Orchard Blend #1. 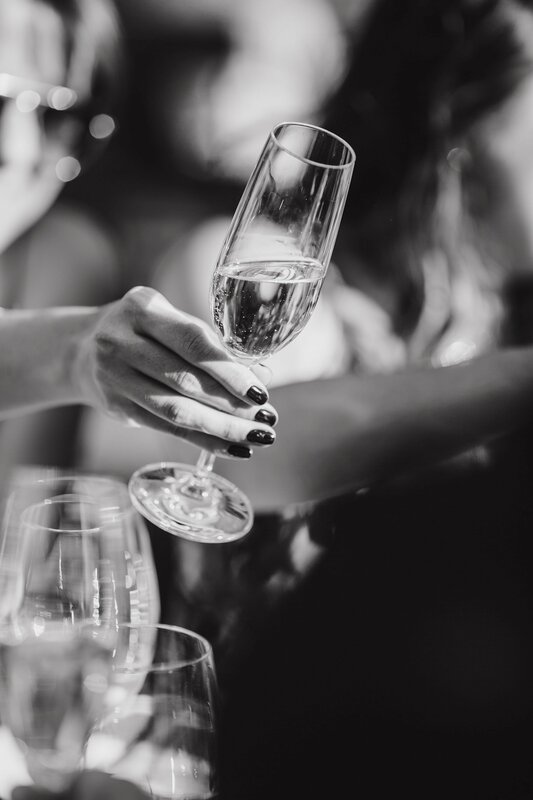 It’s a crisp, mild dry cider that went perfect with a nice selection of local San Diego beers and Northern California wines and sparkling wines. 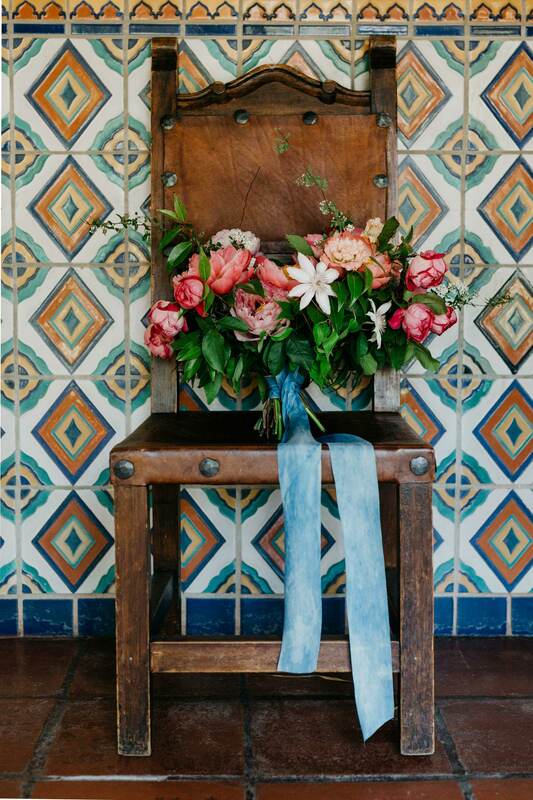 For the flowers, I worked with the insanely talented Rachael from Siren Floral Co. I knew I wanted to use the local colors of Palm Springs: muted desert succulents with bright fuchsia bougainvillea. One of my favorite flowers is the peony and the rest I left up to Rachael. 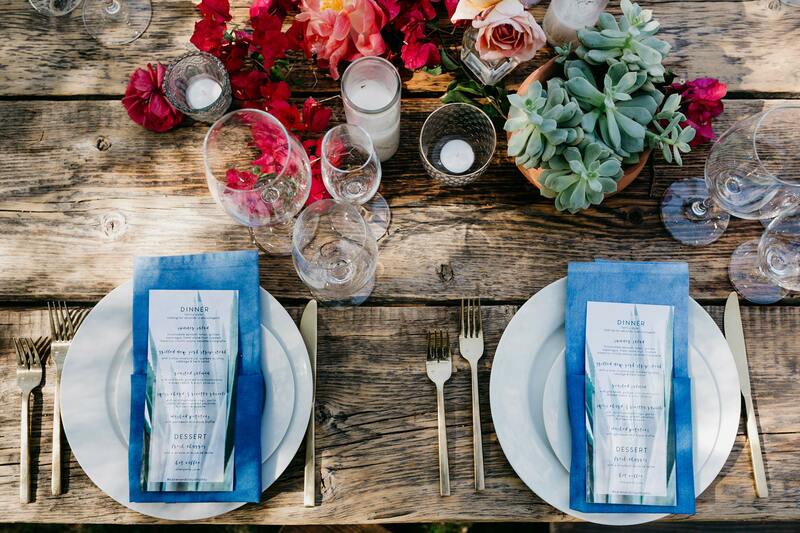 We DIY’d our own dinner napkins (tutorial courtesy of my sister HonestlyWTF) for an added indigo accent. 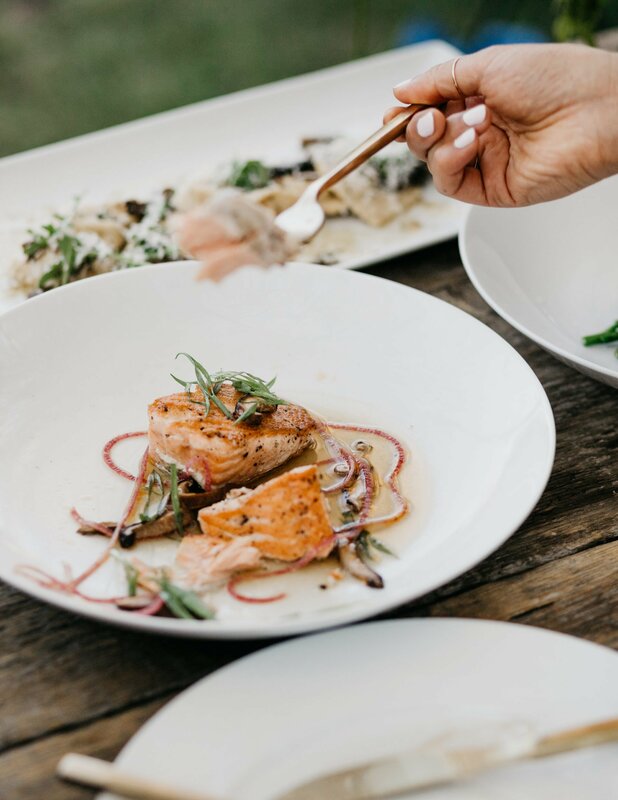 Forgoing traditional individual meals served over multiple courses, we went with a family-style dinner because we really didn’t think there was any other way. 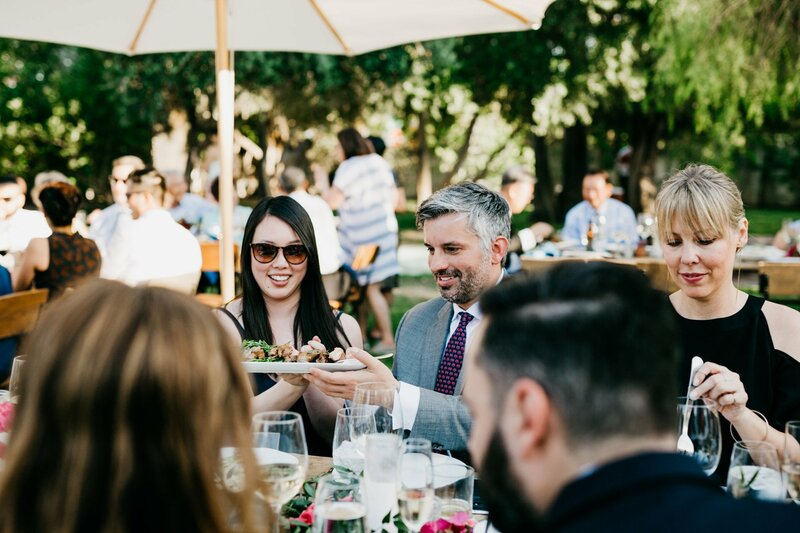 Not only does it encourage conversation and interaction with guests, but I generally feel food is best enjoyed with those around you in this way because everyone gets to try everything! We started off the meal with a beautiful summer salad featuring seasonal stone fruit on a bed of spinach, tatsoi, and grilled asparagus and topped off with toasted hazelnuts, ricotta salata and a sesame vinaigrette. 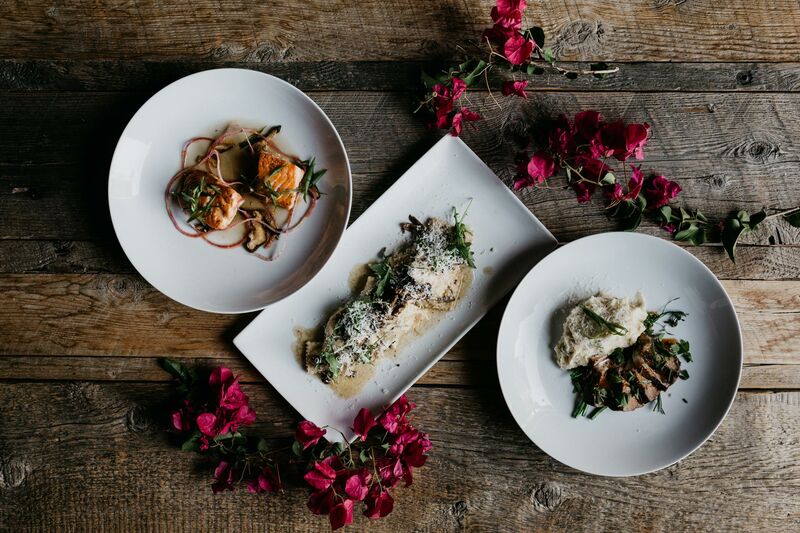 For entrees, we wanted to have a varied selection. While they were items you’d probably find on any California style menu, they had some interesting twists on the flavors and presentation that I’ve only seen Miho present: New York steak, grilled to perfection and served with sauteed yu choy cabbage and herb salad, roasted and crispy-skinned salmon with phở broth, pickled wild mushrooms, shaved radish and arbol chile oil and lastly, ravioli filled with Swiss chard and ricotta, served with wild mushroom ragu, garlic confit, arugula, grated pecorino and a beurre noisette. These entrees were accompanied by heaps of my favorite side: mashed potatoes with parmesan and black truffle! To be honest, Clay and I are not huge fans of cake! GASP! While we’ll eat it and try cakes at events, there are just so many other desserts we prefer over cake. And that’s why in lieu of cake we opted for churros, served with a drizzle of dulce de leche. 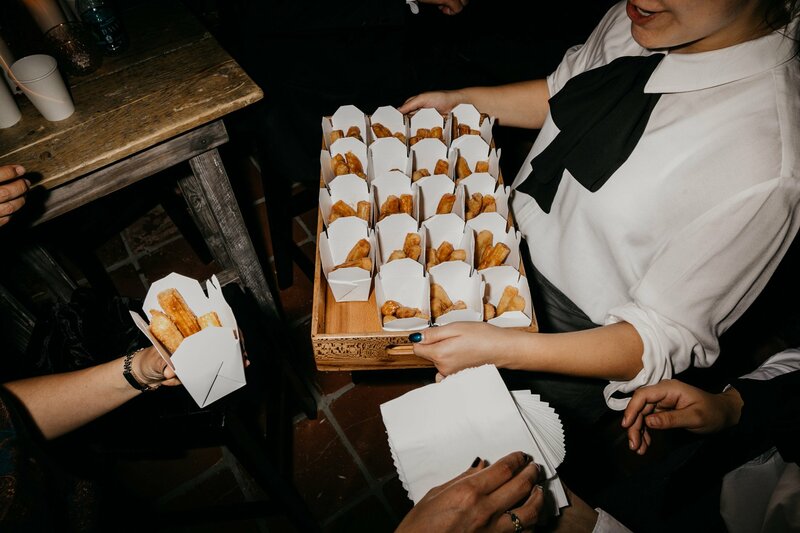 Guests didn’t have to sit down and eat them on a plate, but could walk around with, or in many cases, stand up and seek out servers carrying the trays of the take-out containers with the little fried bites. 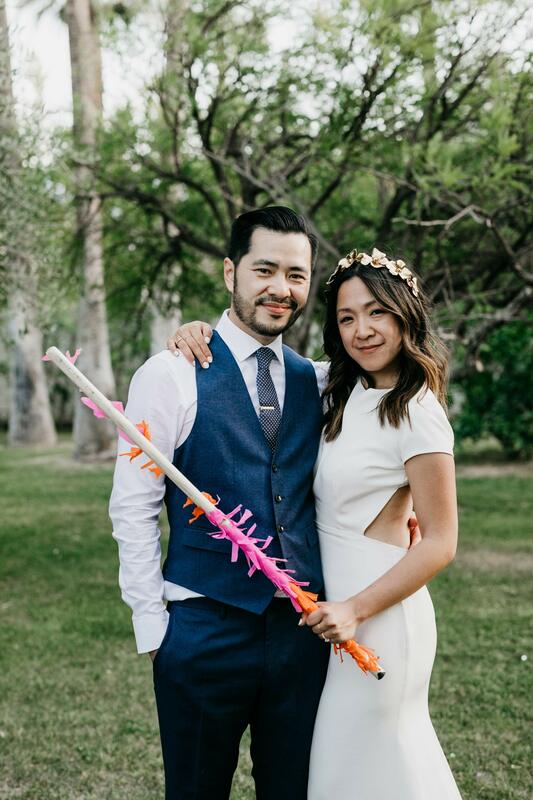 And while it’s a tradition to have cake, we felt a bit rebellious and decided on an alternative cake at our wedding: a piñata cake! 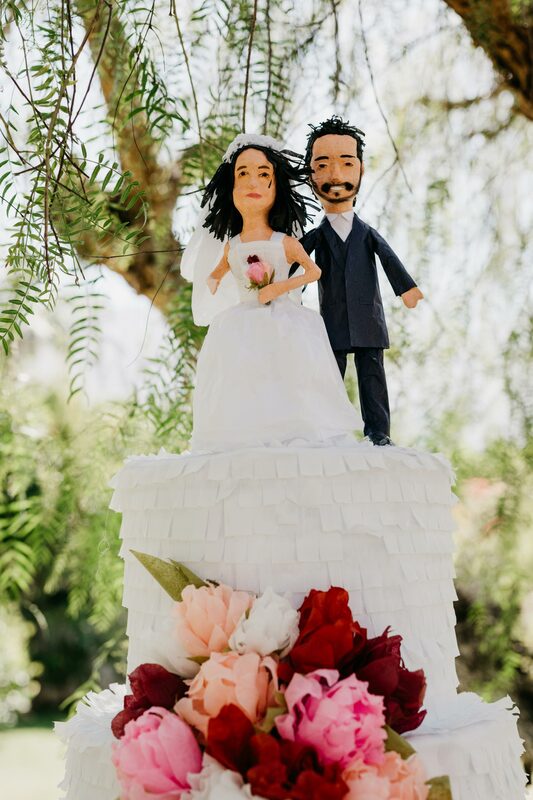 We commissioned a local shop, Amazing Piñatas in Los Angeles, to make our custom piñata cake. 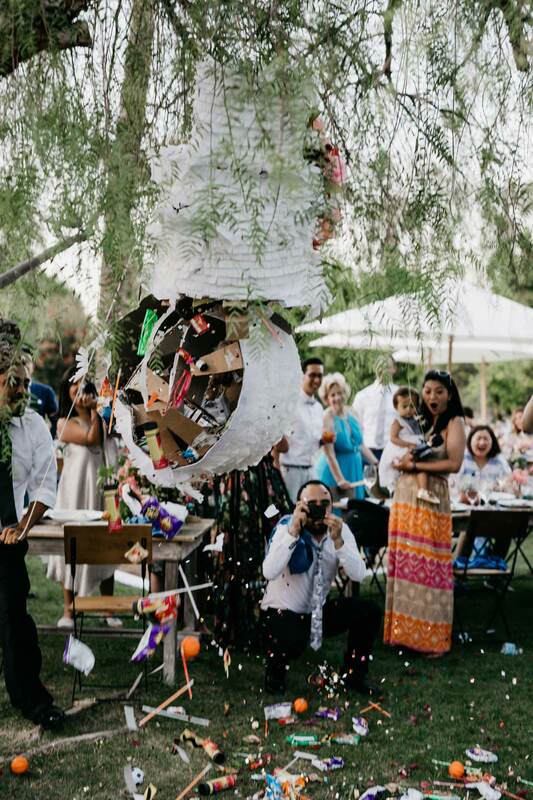 As you’ll see from our video, their piñatas are built with enough structural integrity requiring a football tackle to break! 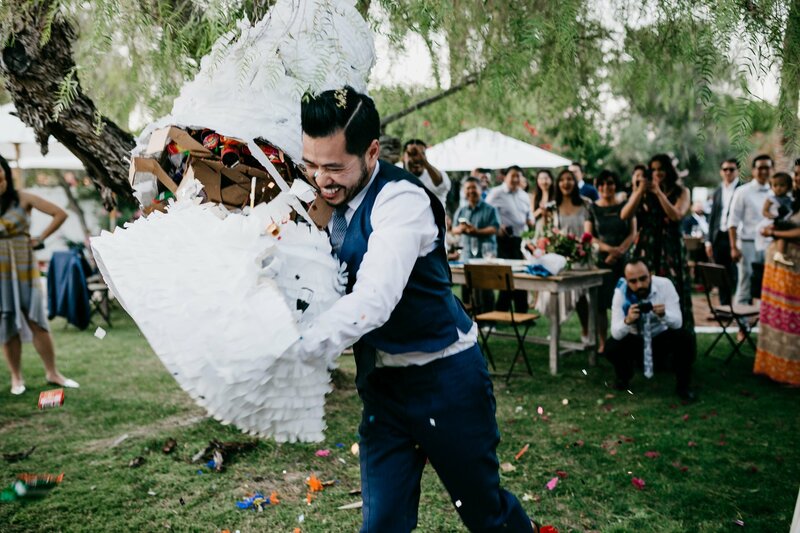 It was a blast to have at our wedding and all guests, kids, and grandparents alike loved the piñata bashing equally, if not more than the goodies. 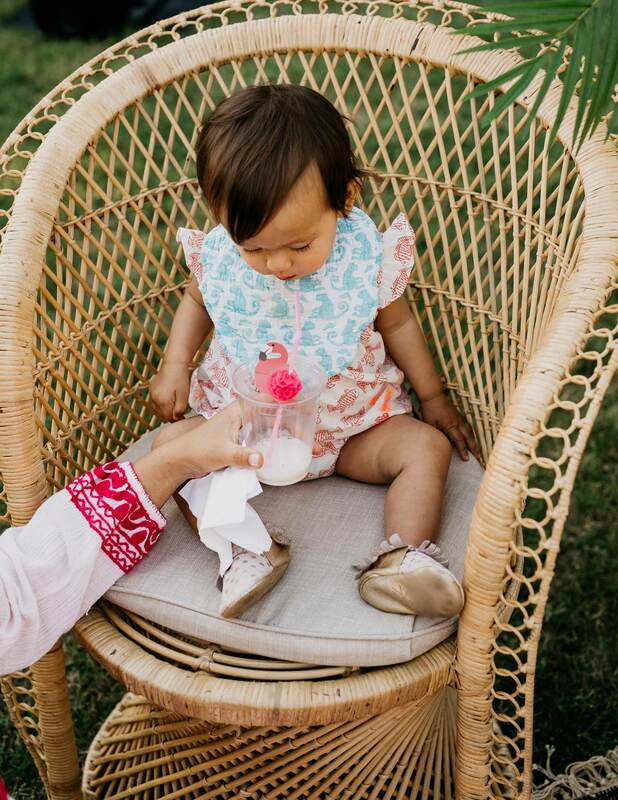 We filled it with party toys and snacks, traditional Mexican treats, bubble blowers, party poppers, and of course, little bottles of booze-filled chocolates for the adults. 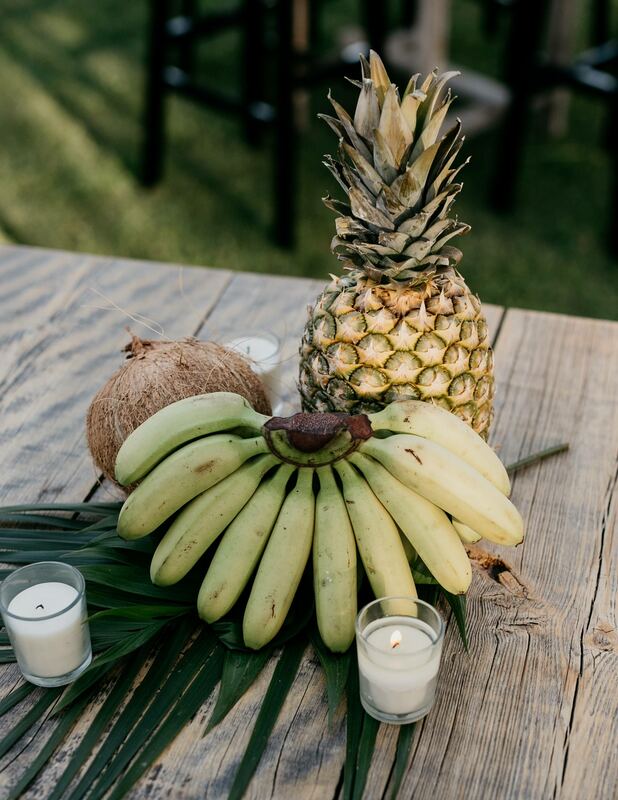 To welcome everyone, we held a welcome party at the wedding venue the night before our wedding in the form of a Tiki and Tacos party! 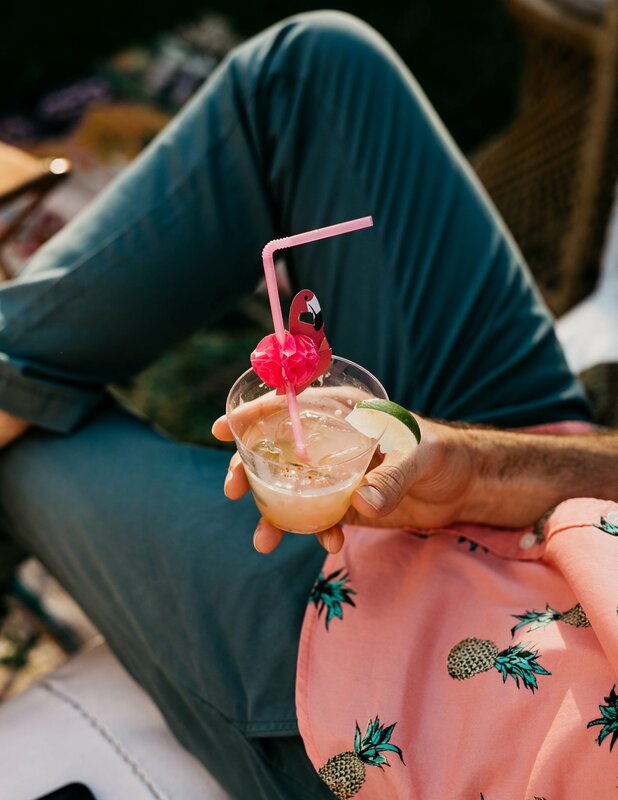 I’m a sucker for tiki drinks and there’s nothing we love more than tacos. 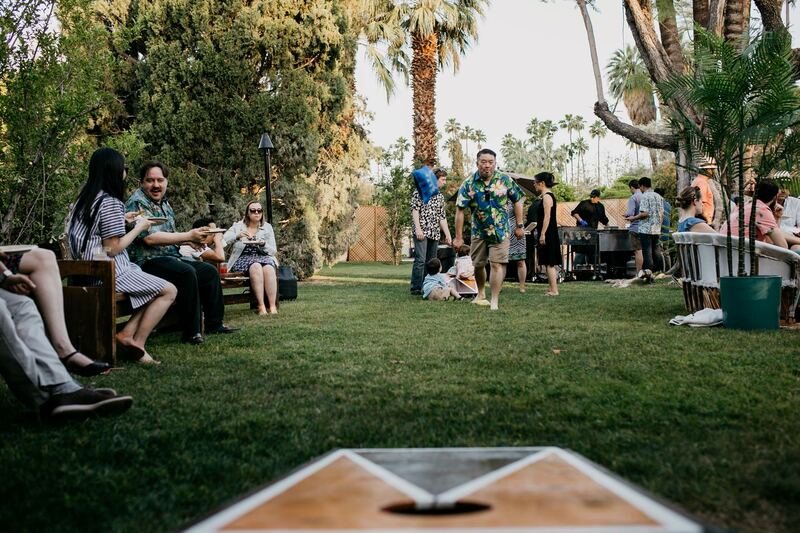 Throw in some oldies music and some great thematic guest attire and you have yourself an amazing party! There was plenty of beer and wine, but we also thought it’d be fun to create our own custom cocktails and enlisted the help of my good friend Kirsta to design them. 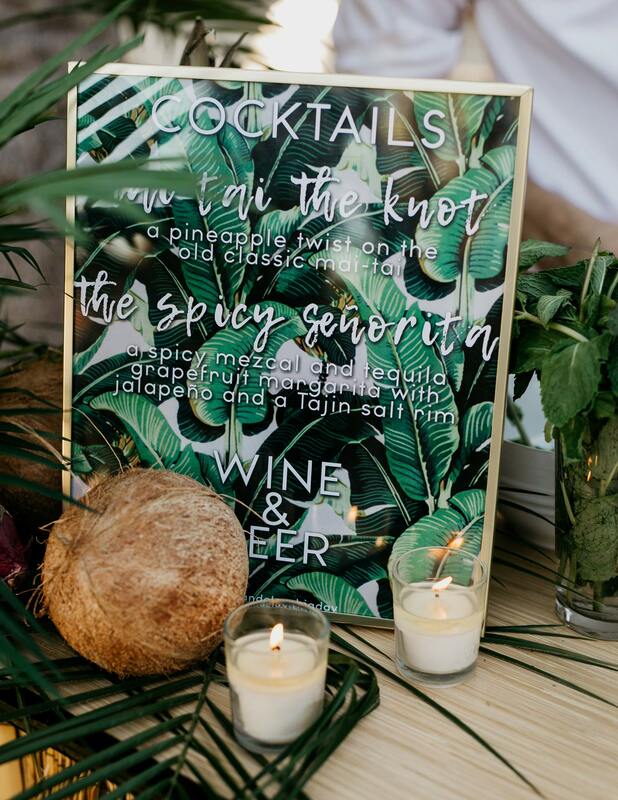 “The Spicy Señorita” was a fun twist on a margarita that had a touch of jalapeño and Tajin salt on the rim and the “Mai Tai The Knot” was a pineapple twist on the classic mai tai. And for the dinner, we wanted to make sure we brought the best taquero that was willing to make the trek out to Palm Springs: East Side Tacos. 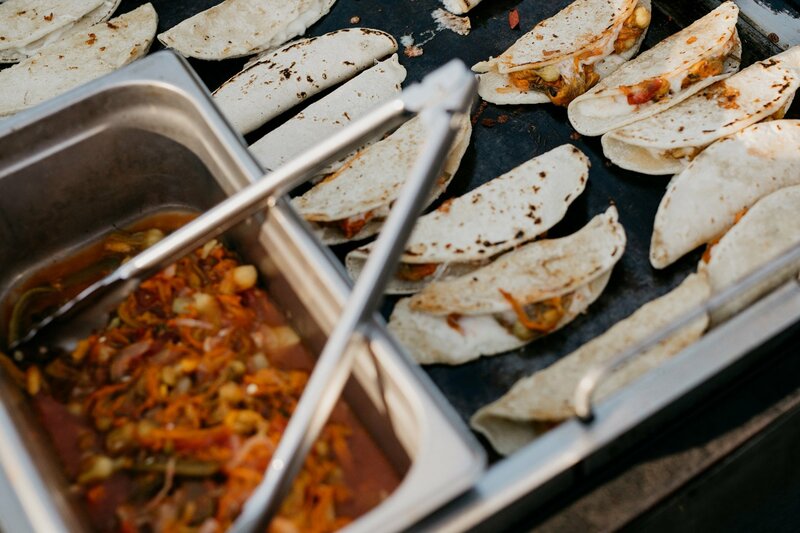 To go along with five different taco meats, East Side Tacos served fresh, hand-made tortillas grilled on the spot. 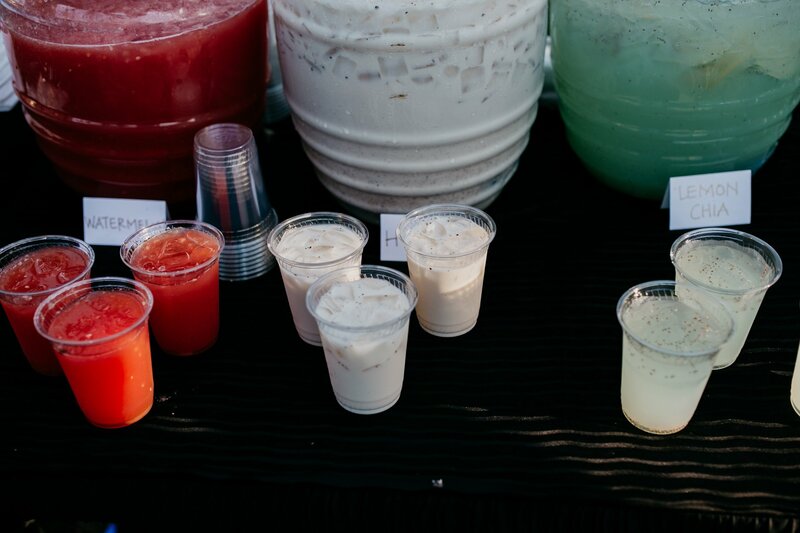 They provided all the condiments, quite a few sides (my favorite was the squash blossom guisado), and an assortment of drinks like horchata, fresh lime-chia and watermelon juice. 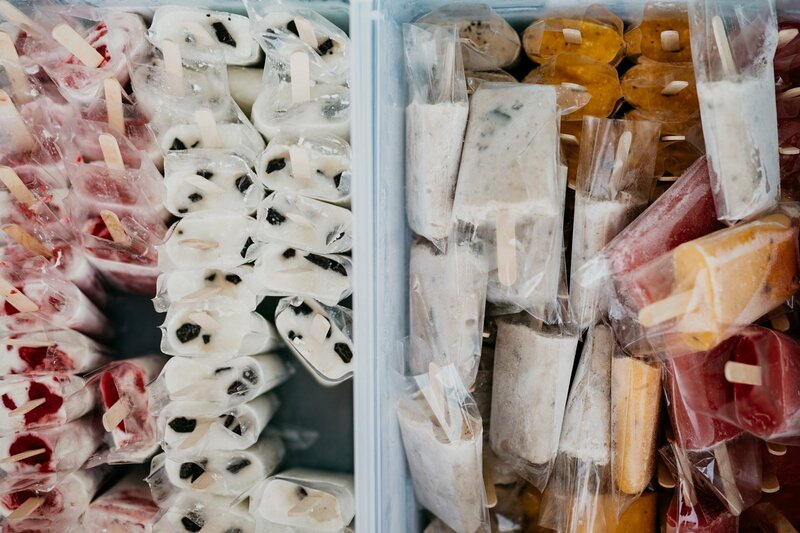 To top off the delicious meal, we had Sí Paletas bring in an assortment of delicious, and interesting paletas flavors: Roasted Banana Chocolate, Mango Chili Lime, Watermelon Basil, Coconut Chocolate and Strawberry Cream. I truly believe the welcome event made for a much more warm gathering at the wedding. Many of our friends and family had a chance to eat and drink together with those they haven’t met, and we got to have a bit more face time with folks, which was great because it’s hard to get it all in during the day of the wedding! Heartly congratulation to you karen. I love your way of your presentation of wedding and very happy to see you that midblowing pics and delicious food everything. 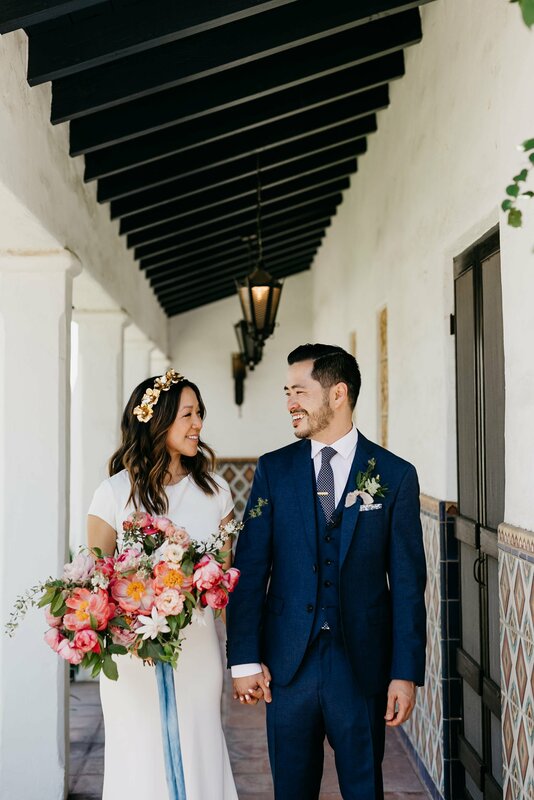 GORG wedding, one of my faves I’ve seen online! 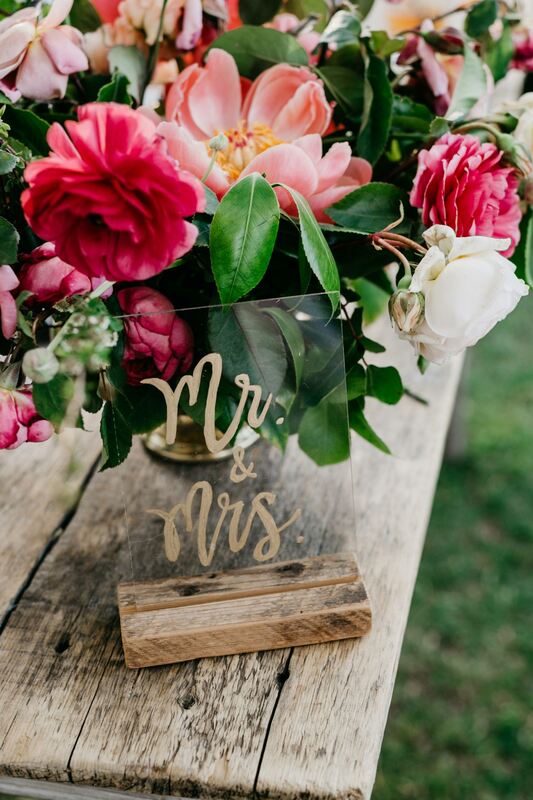 I’ve had a photo of your bouquet pinned to my wedding Pinterest board ever since this came out, and now it’s time to actually order my flowers! Can you tell me where you got your ribbon? That color is *exactly* what I’m looking for, and it’s not as easy to find as I thought it would be. This is what I think yours is (https://www.silkandwillow.com/collections/spools/products/indigo-clouds-sheer), but if not, I wanted to see if you could tell me where you got it? Thanks so much Jennifer and congratulations! Yes, the ribbon is from Silk and Willow and the color is Ocean Gold 🙂 It’s so beautiful, I think you’ll love the color! Absolutely amazing! Can you plan my wedding?? What a gorgeous wedding. Congrats to both of you. Happy, healthy years to come. Delicious food and drinks,as always. Hi Karen! 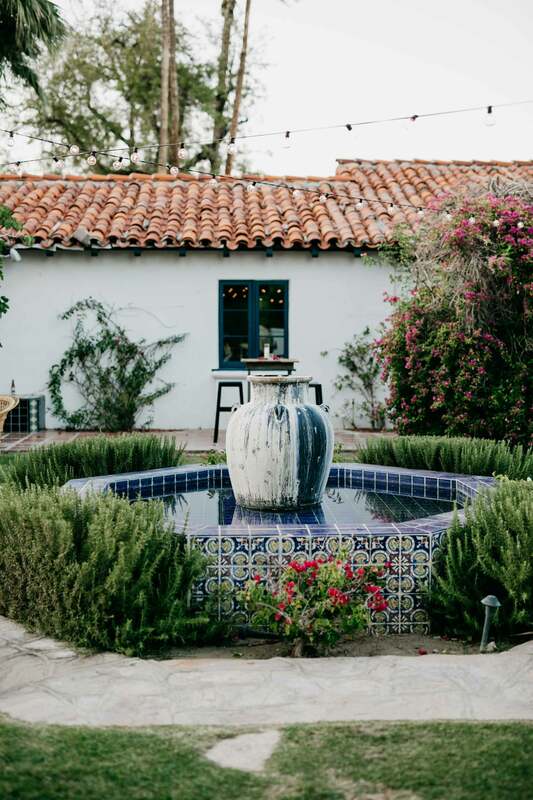 I have been doing research about this property for my own wedding and I love what you did with the space. You mention in your post that you had to move the dance floor indoors, I was just curious why it had to be moved inside? And what kind of set up you had then? Any additional info would be a great help since the music is super important to us! Thank you! Thanks Rae! 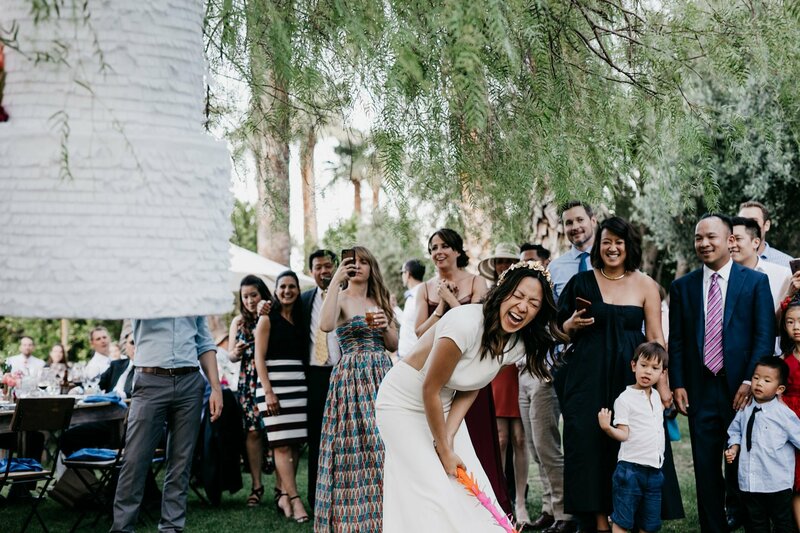 I loved the venue and would recommend it, but about a month before the wedding, Palm Springs started enforcing their noise ordinance and the venue in turn has been strictly enforcing it. This meant no amplified music outside so we had to move the dancing inside which totally worked (surprisingly, the inside is large enough!) It was a bit difficult getting everyone to get up after dinner and move to a different location for dancing but otherwise worked out fine. 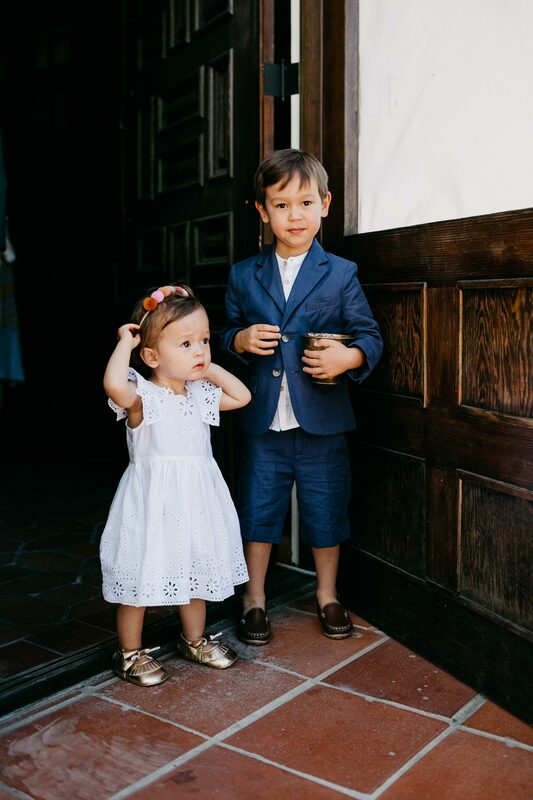 this is lovely and wonderful but WHERE is that rehearsal dinner dress from?! Thanks Abby, it’s a Mara Hoffman dress! Hi Karen! 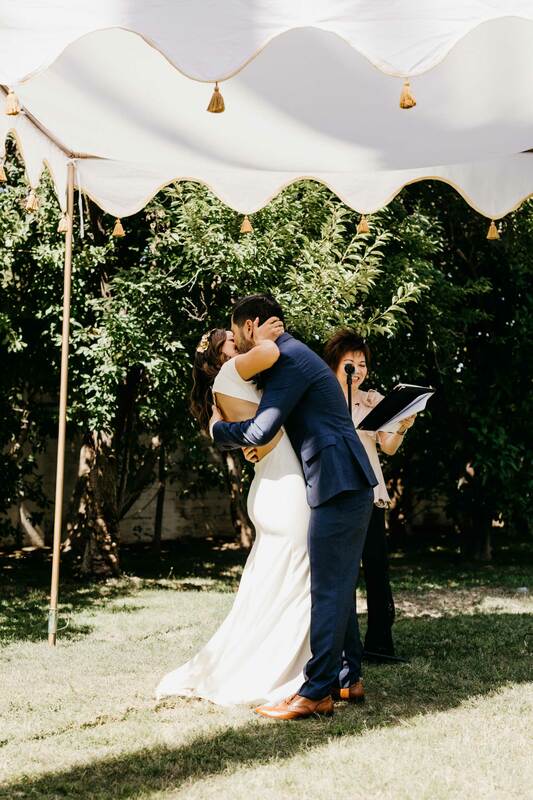 BEAUTIFUL wedding photos!!! Question – I am getting married in September and looking for a similar hairpiece – any chance you would sell me yours? Odd question but had to ask!! 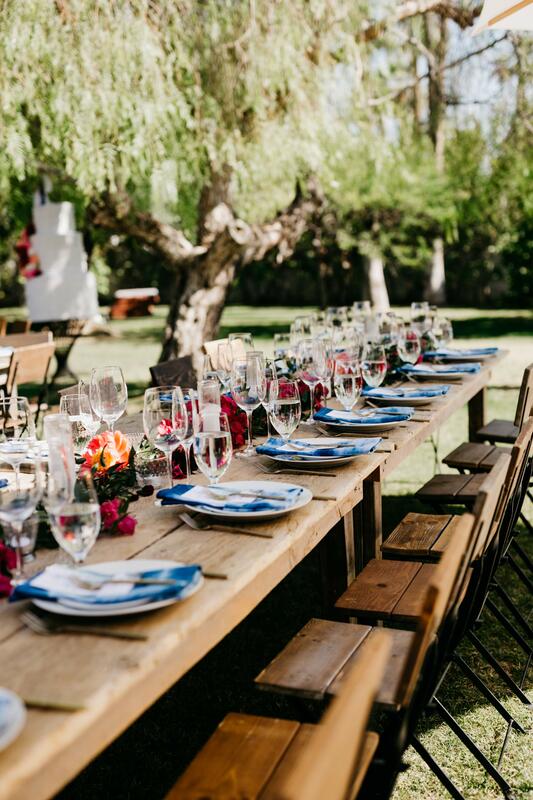 Beautiful aesthetic and congrats on a fun/gorgeous/tasty wedding ! such a beautiful wedding..plus i love all the little details to truly represent you both. That was our goal to make it as personal as possible, thanks!